Let me first begin by saying that I loved this anime! 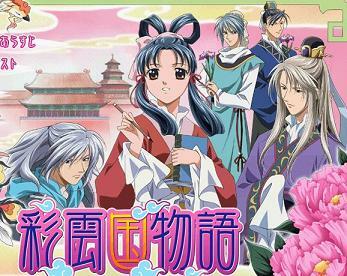 Saiunkoku Monogatari, The Tale of the Land of Colored Clouds or The Story of Saiunkoku, is about a young girl, named Shuurei Kou (center in photo above), trying to become the first female official in this ancient Japanese world ruled by men. 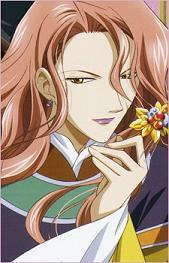 She lives with her father, the eldest son of the noble Kou family. Her mother died when she was younger, shortly after adopting a boy they named Seiran (left in the photo above), who we come to know as the exiled prince Seian. The anime starts off shortly after the Emperor passes and after most of his sons killed each other in a fight to take the throne. The throne passes to the youngest son, Ryuuki (front right in photo above), who never wanted to be emperor. Shuurei is brought into the Imperial Harem to try and get Ryuuki to do his duties as an emperor. Ryuuki and Shuurei become very close; Ryuuki eventually tells her that he’ll take no other wives other than her…that is if she’ll marry him! Otherwise, he fully intends to rule and die unwed and childless. The problem is that Shuurei wants to make a difference; she wants to become an official and help in any and every way she can in the world. I won’t go into too much detail about specific characters; that would take far too long seeing as there are so many. However, the characters are so full of depth and mystery. You never know what they’ll do next. There’s comic relief, though not too much and at just the right moments. I loved watching how each character grew to love each other or betray one another. It’s an endless cycle of drama. However, there were a couple problem, but many pluses. The mystery is a plus, I sometimes found that the mysteries never detached from the main plot. However, I found, more so in the second series, that some of the issues are never resolved. The issue of Rio Hyou (pictured left) was the biggest one that I had a problem with. 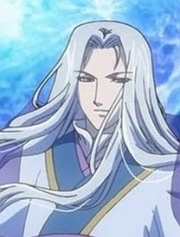 He is the head of the Hyou family and (as you put together clues) you find out that he was the one who kidnapped and held Shuurei’s mother against her will before she met Shuurei’s father. The Hyou family is an ancient noble family that has supernatural powers…you do encounter a few of the family members and those issues are resolved. However!, Rio Hyou (almost 80, but appearing mid 20’s), has returned to Saiunkoku to obtain Shuurei, whom he wants because she looks like her mother…but you only meet him a few times and the story never passes this point! Nothing is ever done majorly with Rio Hyou; he is never defeated, killed, or encountered again. 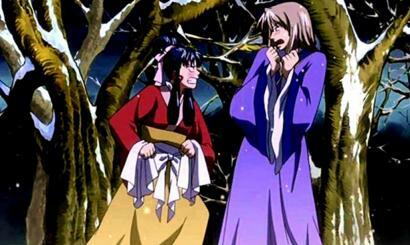 He does send his sister to obtain Shuurei, but she fails. You would think that the story would continue until he either gets her or he is killed, but nothing else happens with him. I really came to love his character and would’ve loved to have seen more of him. Another personal issue that was never resolved for me was involving my favorite character Sakujun Sa (pictured right), a major antagonist in the first series. Towards the end of the first series, he poisons himself because Shuurei will not allow herself to love him. You see him bleeding from the mouth and dying; Shuurei runs to find help and returns only to find nothing! There’s no body! He was never found! I don’t know about anyone else, but I want to know what truly happened to him! The story leads you to believe that he isn’t dead in the second series, but never reveals whether he is or isn’t. I can’t stand this!!! He was my absolute favorite character (since I usually fall for the evil ones). As far as artwork, it’s good. It isn’t necessarily my favorite style, but it does match the anime. The music was a little difficult for me at first (as far as the opening and ending themes), more so the opening, but I came to like it after a while. There are a lot of trivial issues I could go into (places the story could’ve been better or twists that should’ve happened but didn’t), but I won’t. I loved this series because the story was interesting and the characters are fantastic. Despite the few issues I’ve spoken of, it’s still fantastic and worth the time to watch. I would definitely watch it again and recommend it to others. Saiunkoku Monogatari is currently in Japanese with subtitles and consists of 2 series, 39 episodes each. There is a manga (7 volumes) for this as well…will be reading that in the future. The opening song is Hajimari no Kaze by Ayaka Hirahara, the 1st ending is Saikou no Kataomoi by Sachi Tainaka, and the 2nd ending is Asu e by Teruya Miho.